Flexible course access from your web browser or mobile device. This On-Demand CISSP Bootcamp course is designed to comprehensively prepare students for the CISSP exam. Access intensive, self-paced course lessons without limitation, from any web browser or mobile device. Our CISSP training program covers all aspects of the CISSP CBK Domains. Includes 18+ hours of interactive course lessons, full CISSP study guide, CISSP chapter quizzes, and more. "This online exam prep delivers as promised. 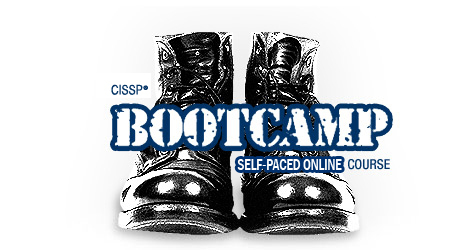 Top notch CISSP training that will dramatically expand your "insight" base. A comprehensive yet affordable approach to CISSP exam preparation." Taught by Shon Gerber, each course milestone contains interactive training lessons designed for On-Demand learning and busy schedules. Complete the entire curriculum in order, or re-visit training lessons as many times as you like. A detailed CISSP Study Guide is included as a supplement to the course. The CISSP Study Guide summarizes each course session, focusing on key CISSP concepts from each segment. 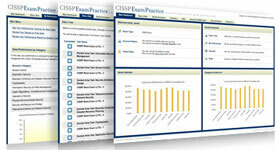 CISSP quizzes are provided following each interactive milestone to reinforce CISSP topics and test knowledge. Add our CISSP exam system and receive an additional discount. Ready to learn on the go? Use your smart phone or tablet to access all course features no matter where you are. View lessons, take quizzes, and review study guide material all from your mobile device. Developed by Shon Gerber, below is the detailed curriculum covered by this CISSP certification course. Students will come away with a thorough understanding of IT Security through the perspective of ISC2 and the CISSP Common Body of Knowledge (CBK), and will be prepared to take the CISSP exam. Laser focus your study efforts with over 1,000 professionally authored CISSP questions.